Reverse osmosis (RO) is one of the most popular methods for effective water purification. It has been used for years to purify contaminated water, including converting brackish or seawater to drinking water. Reverse osmosis is a process in which dissolved inorganic solids (such as salts) are removed from a solution (such as water). This is accomplished by pushing the water through a semi permeable membrane, which allows only the water to pass, but not the impurities or contaminates. Reverse Osmosis can deliver bottled-water quality safety and taste by removing over 99% of dissolved minerals, chlorine and contaminants. Many leading bottled-water companies actually use large-scale RO to produce their water. Reverse osmosis systems are found in several drinking water applications from restaurant, food and beverage equipment to grocery store produce misting. The ASCO Series 212 solenoid valve is designed for these type systems. The valves come with NSF approvals for use in drinking water systems and also is design with unique “FasN” quick connection system. The valves are designed to handle 150 psi up to 180 deg. F. and has low wattage coils in both AC and DC. 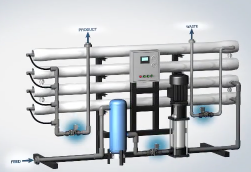 See the video below for an illustration of where these valves are used in RO systems.